A newly refurbished and renovated home with 3 double bedrooms, large lounge and dining, full kitchen, bathroom and ensuite. The house has wrap around decking and has all day sun streaming in. You can laze away the day sitting in the bay window with views of Mt Ngongotaha or take the kids and wander into Ngongotaha Village and play in the playground or try your luck with trout fishing. Ngongotaha Village is only a few hundred metres walk fro the house. Ngongotaha Village has a vibrant atmosphere with a variety of shops which include automotive, chemist, bar, takeaway food, hairdresser, post office, and cafe. There is a skate park and a childrens playground, trout fishing in the local stream and has easy access to Lake Rotorua. It gives you all the home comforts without having to be in the hustle and bustle of the city. Nearby attractions include the agrodome, zorb, rainbow springs and the gondolas. The local bus operates every day and runs past the end of the street. It travels to Rotorua city giving you access to the famous tourist hot spots. If you prefer to drive, Rotorua is less than 10 minutes away. You can base yourself here and visit the wider Bay of Plenty area. 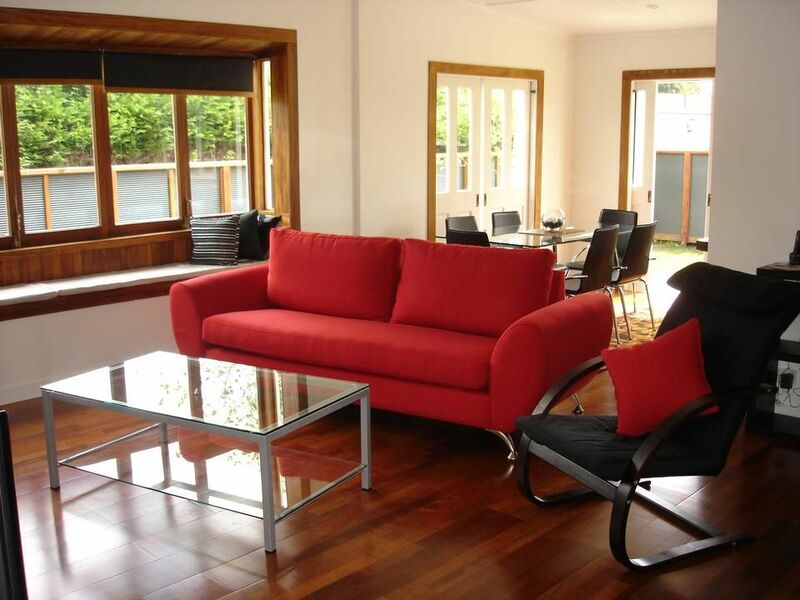 Corporate - If you are looking at coming to work and stay in Rotorua and need long term furnished accommodation we are happy to negotiate a weekly or monthly rate. We are happy for you to bring your dog, cat and goldfish. Our aim is for our Cottage to be your home away from home when you work away. This Cottage is our home so we ask that you treat it with respect and leave it as you find it. We are pet friendly but we do charge fee of $30.00. If you wish to discuss this with us, please email. When emailling please let us know what type of pet you have so we can discuss requirements. When emailling, you will be writing directly to the owner. Pets are also ok. Please advise us. This property is a 100 year old refurbished house that has very good energy. We love it as it has a nice "feel" and you are part of the neighbourhood. Bathroom 1 has bath, shower, vanity, toilet. Bathroom 2 has shower, vanity, toilet. Some items like herbs spices oil etc, handi towels, rubbish bags, tea, coffee, hot chocolate, sugar, milk. Just ask and I will let you know. All dishes, serving ware, utensils and pots supplied. We have steps and decking. Lovely place to stay with everything you need. Clean and tidy and Tanya is so helpful and "On to it". We will be looking forward to our next stay. We loved staying in the house. It was huge, very clean and bright. The house was well furnished and equipped with everything one needs. We especially appreciated the gas BBQ. The back yard was also a great place to relax after touring the area. Tanya is a very gracious host and responded immediately to an inquiry we had about the oven. Within five minutes she popped by to ensure our issue was resolved. Friendly owner to work with. Great home. Property was perfect for our stay, very secure for our we dog. Yummy plums as well. Hope to be back next year. Beautifully presented, well equipped and great location!!! We are located in Ngongotaha Village, which has all the local shops, parks and amenities, and are 8 kilometres from the central town area. We are close to some tourist attractions and Maori cultural experiences.